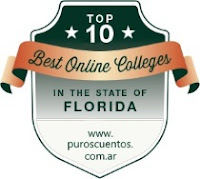 We offer here a list of institutions that provide online university degrees. By choosing one of these institutions, anyone can take a big step in his or her career, studying online in an affordable institution, without schedule or location limitations. The intention of this list is to help find the option that best suits your needs and budget. The information was obtained from a research report by Great Value Colleges, a site specialized in researching colleges and comparing them in terms of their respective costs. In the original article, published on July 2018, the list of the 10 most accessible universities is ordered using a scoring system that takes into account the cost, the relationship between the number of students and number of teachers, and the national recognition of the institution (to see the scores, costs and other data of each institution, refer to the original article). All institutions on this list are accredited by the Southern Association of Colleges and Schools, Commission on Colleges. The Indian River State College was established in 1959. With a student-to-faculty ratio of 27 to 1, the institution offers four options of online associate degrees and eight online bachelor options. Saint Leo University is a Catholic institution of liberal arts of higher education, established in 1889 by the Order of Saint Benedict. With a student to teacher ratio of 16 to 1, the institution has seventy-two offers of online degrees, from associate degrees to doctorates. Daytona State College is a member of the Florida College System and was established in 1957. With a student to teacher ratio of 17 to 1, the institution's online education options include four associate's degrees and four bachelor's degrees. Polk State College was established in 1964. With a student to teacher ratio of 27 to 1, the institution's online education options include an associate's degree and five bachelor's degree completion programs. The Seminole State College of Florida was established in 1965. With a student to teacher ratio of 28 to 1, the institution's online education options include ten associate degrees and five bachelor's degrees. St. Petersburg College was established in 1927 under the motto "Light and Truth." With a student to teacher ratio of 22 to 1, the institution's online education options include fourteen associate degrees and thirteen undergraduate degrees. The Pensacola State College opened its doors in 1948 and has been offering four-year careers since 2010. With a student to teacher ratio of 22 to 1, the institution offers an associate's degree in economics entirely online. The Florida State College at Jacksonville was established in 1965. It offers a significant number of four-year careers. With a student to teacher ratio of 22 to 1, the institution's online education options include seven associate degrees and eight undergraduate degrees. Miami Dade College is the largest institution in the University System of Florida, with more than 150,000 students. With a student-to-teacher ratio of 18 to 1, the institution's online education options include nine associate degrees and five bachelor's degrees. The Baptist College of Florida was established in 1943 and is affiliated with the Florida Baptist Convention. With a student to teacher ratio of 10 to 1, the institution's online education options include two associate degrees, eighteen bachelor's degrees and two master's degrees.